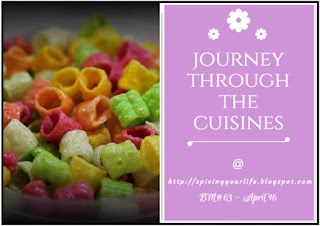 We are nearing the finale of "Journey through the cuisines". So, far it has been a satisfying marathon. My co-marathoners would also agree, that this was a smooth marathon, though many of us were cooking and posting the same day. May be we are getting used to these Mega Marathons, we are finding it very easy. As i write this post, there are some super enthusiastic mates, who have decided their next marathon theme and have started cooking too. As i said in my first post, we are a crazy bunch, a mix of extremes. Today's post is a Weekend Thali. Something which i planned yesterday. I originally decided to do Yardlong beans Paruppusli. Then came the idea of yennai kathrikaai kuzhambu and i finally added yelumicham pazham rasam (lemon rasam) to the list. All put together it became our lunch today. It was one delicious plate. My elder one fell in love with the kuzhambu, he went on talking about it. 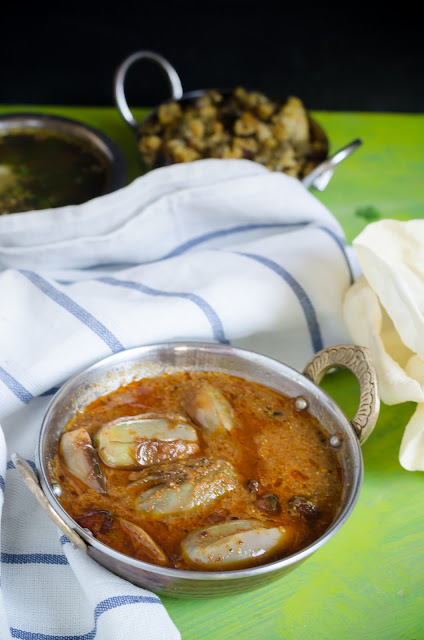 Yennai Kathrikaai Kuzhambu is nothing but brinjals/eggplants stuffed with freshly ground curry powder and then simmered in spiced tamarind gravy. Fingerlicking good!! a gooseberry sized tamarind, soaked in warm water for 15 mintes. Roast each ingredient under 'Roast & Grind' separately in a pan. Let them cool completely. Grind it to a fine powder in a mixie. Keep the powder aside, we will be using 1/3 cup of this powder, the rest can be stored in an air-tight container and can be used while making dry curries. Wash and chop the stem of all the eggplants. Slit them lengthwise, like a '+'. Do not cut fully, we just need to make a slit till the bulb of the eggplant and stuff it with the spice powder. Once slited, stuff 1 tsp of spice powder into each eggplant and keep it aside. Extract 4 cups of tamarind extract from the soaked tamarind and discard the pulp. Heat a wide pan with gingely oil given under 'Tempering', splutter mustard seeds, add hing, fenugreek seeds, red chilies, and curry leaf. Now add the stuffed brinjals, one by one, keep the flame simmer and saute it for 5 minutes. 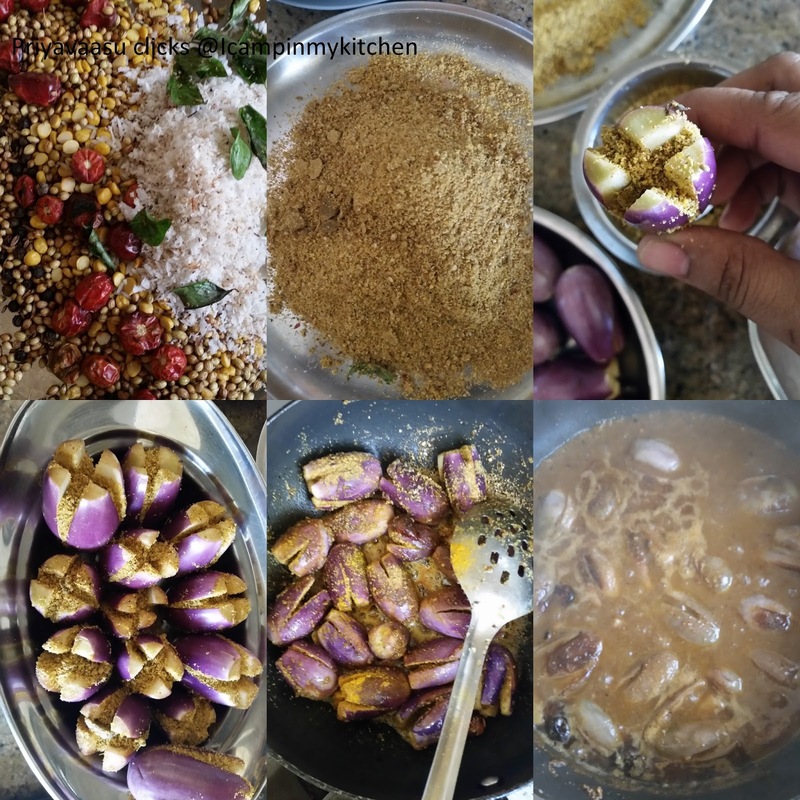 |Add half of the salt to the brinjals and mix. Stir frequently and gently. We do not want the brinjals to separate and also not burn. Let the brinjals cook in a simmer flame in oil for another 8-10 minutes. 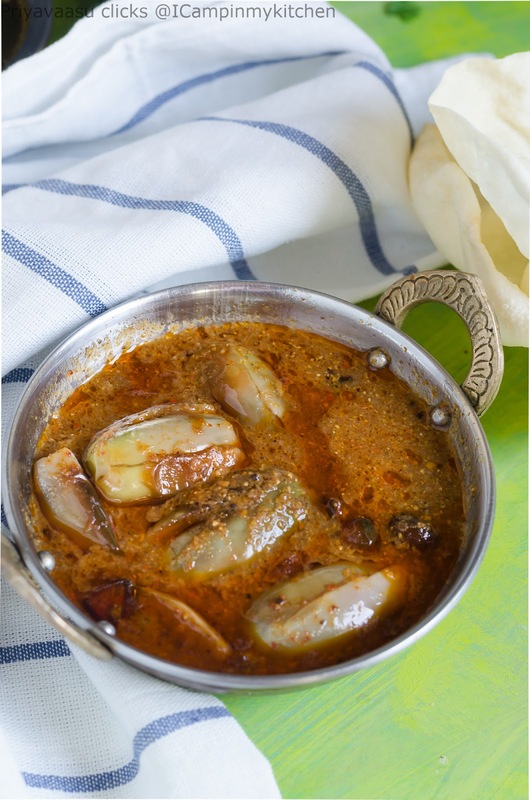 When they are half cooked, add the tamarind extract, sambhar powder, spice powder, turmeric powder and salt. Let this cook until the rawness of the spices disappear and the gravy thickens. Once it thickens, remove it from flame. Serve it warm with rice. I served it with Yardlong Beans Paruppusli and Yelumichampazham Rasam for our weekend lunch. Yummy 'Y' dishes thali. We have a version of this eggplant dish too and this one it fit for parties. And same pinch. I made that yard long bean curry too but didn't post it. Slurp slurp, kuzhambu looks absolutely fabulous, lipsmacking here.. Priya you did a fantabulous job with your Y dishes. spicy kuzhambu. :-) Great thali. Love the spread. Absolutely delicious yennai kathrikkai kulambu. Always my favourite..
Wow you surely made up for the X factor missing priya..that thali is so inviting! 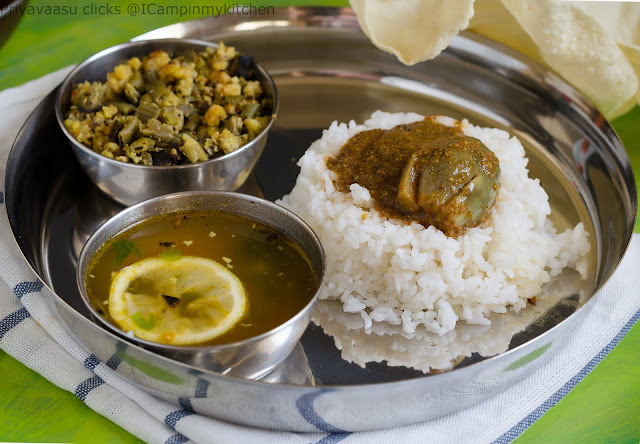 Mini thali looks delicious and brinjal curry is yum!! All dishes looks delicious in the thali. That thali is a definite crowd pleaser. Wow, such a wonderful thali with Y dishes :) Lovely pick!